Continuing their mini-Australian theatre festival that started with the powerful “Forget Me Not” a few months ago, Upstream now presents a magical yet visceral production of David Milroy’s “Windmill Baby.” Set in the outback at a station where cattle are tended to mainly by aboriginal men and women who work side by side, the story unfolds in flashbacks by our main character, Maymay Starr. She revisits the station 40 years after she toiled there and lived a meagre yet colorful life. The only modern interruption to the story is the occasional ring of her cell phone as her daughter tries to make sure she’s safe and sound. Although her ramblings often question the “sound” part of her current existence, she gives us a vivid tale of what life was like those many years ago and the life, love and tragedy that takes place. 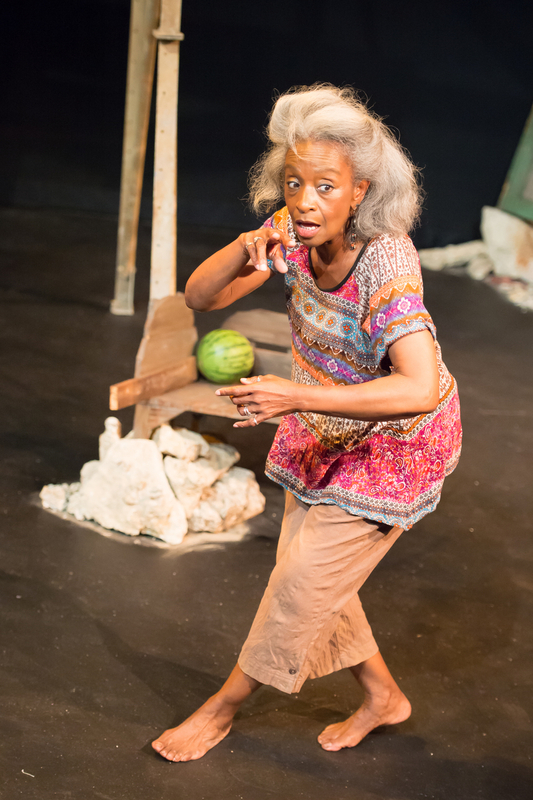 Linda Kennedy, best known for her work as Artistic Associate Director at the Black Rep, has graced other local stages as well and always brings a dynamic to her roles that makes her a true icon in local theatre circles. This is a marvelous portrayal and, although a one-woman show, she creates a series of unforgettable characters that surrounded her life in those days at the station. As she first discovers a washtub with laundry of her Missus left there supposedly for those 40 years, she begins to hang the bloomers and other items on a clothes line that her husband put up for her those years ago. She begins to tell us about her time there and plays the people who surrounded her including the proper yet kind Missus, her own mother, her husband Malvern and the crippled Wunman. Born the first of twins, he came out with a withered arm and disfigured leg while his twin- Tuman, born perfect, soon died. Wunman becomes her best friend and confidante, planting a garden to which she contributes to and sharing most of her joys and sorrows. There’s also the often vindictive Boss, Sally- who she locks horns with in the battle to win Malvern, the country doctor and even Wunman’s dog, Skitchim who plays an important role later in the story. Through voice inflection, body language and sometimes just a look from that face full of emotion, Ms. Kennedy moves from one character to the next in flawless fashion. Her story is humorous and she even gets an audience member on stage at one point to tell one of her many anecdotes face to face. It’s a marvelous evening that entertains, shocks and touches the heart. The Windmill baby (or babies) involved reveal some horrible facts of the treatment of Aboriginal people that still exists today and the final reveal is also quite a surprise that includes a powerful tribute and perhaps tradition that closes the show. As in so many Upstream productions, music plays an integral part. Talented artist Farshid Soltanshahi returns to play various instruments (some of his own invention) to accompany the many stories this wise old spirit tells. Patrick Huber’s scenic design brings a vastness to the small Kranzberg stage. It includes the massive lover half of the windmill along with a small shack and several other well-weathered set pieces with the Australian outback looming in the background. To enhance this setting tony Anselmo’s lighting design is perfect and includes a marvelous effect thrown on the wall behind the musician. A gobo shows the shadow of the windmill blades at rest and, at particular moments throughout the performance, those blades slowly rotate. It’s a mesmerizing effect and special kudos to Technical Director Mark Feazel for bringing all of these elements together and transporting us to this very special place. Keaton Treece is also to be commended for a workable and effective costume design for Maymay. Director Philip Boehm is truly a magician. He has brought so many U.S. premieres to Upstream and they are all special in their own way. But “Windmill Baby” takes us on a journey that is not only magical, it is inspiring as well. 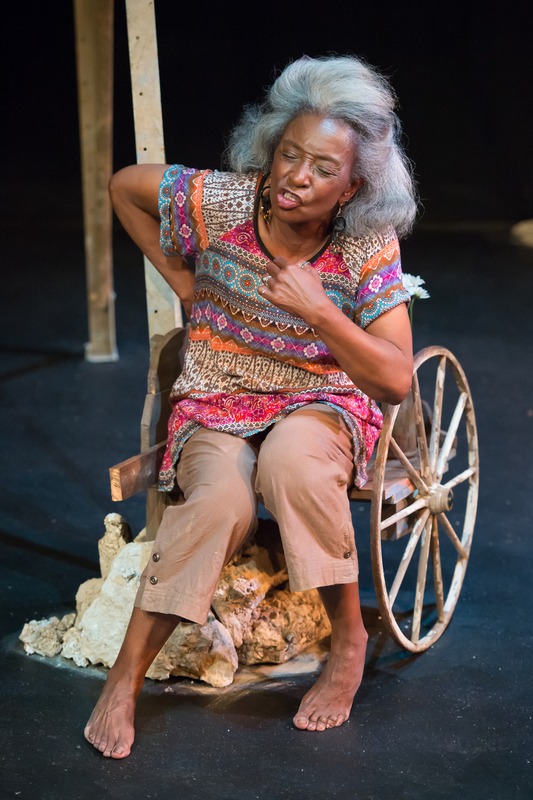 Call Upstream Theatre at 314-863-4999 or contact them at upstreamtheater@sbcglobal.net for tickets or more information. 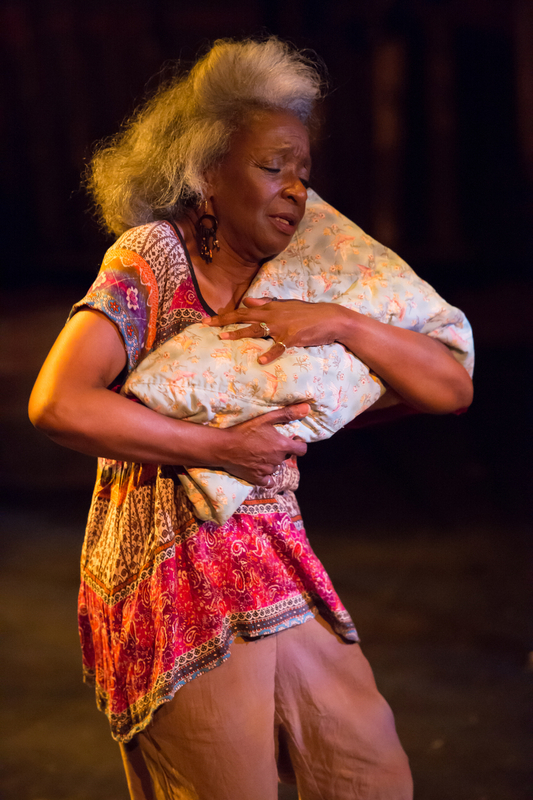 “Windmill Baby” runs through May 11th. This entry was posted on April 28, 2014 at 9:43 pm04 and is filed under Uncategorized. You can follow any responses to this entry through the RSS 2.0 feed. You can leave a response, or trackback from your own site.